Demonstrative pronouns replace a specific noun that was mentioned previously. In French, they must agree with the noun(s) in number and gender. 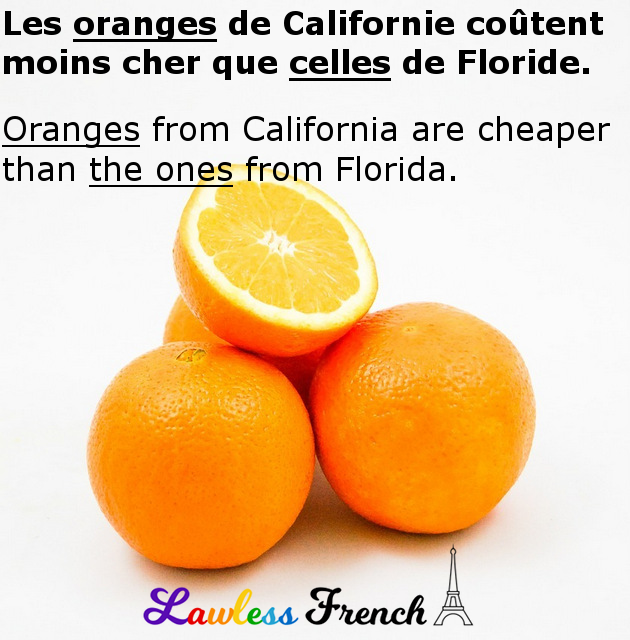 Les oranges de Californie coûtent moins cher que celles de Floride. 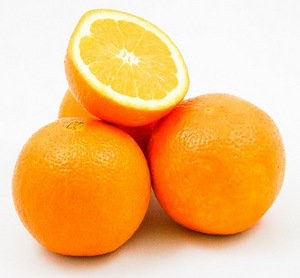 Oranges from California are cheaper than the ones from Florida. Ce roman est trop court, et celui-là est trop long. This novel is too short, and that one is too long. + The singular adjectives can both mean "this one" or "that one"
+ The plural adjectives can both mean "these" or "those"
+ When the context does not make it clear whether the nouns are nearby or far away, you can attach a suffix to the pronoun. Demonstrative pronouns cannot stand alone, as in J’aime celui or Ceux sont bons; they must be used in one of three specific constructions. –ci = here / nearby = "this one" or "these"
–là = there / far away = "that one" or "those"
J’ai acheté deux cafés ; celui-ci est est décaféiné. I bought two coffees; this one is decaffeinated. Je ne peux pas décider entre cette voiture et celle-là. I can’t decide between this car and that one. J’ai trouvé le livre d’histoire, mais je cherche toujours celui de chimie. I found the history book, but I’m still looking for the chemistry one. Voilà celui dont je t’ai parlé. Here’s the one I told you about. Thank you for the clear post. It’s very common to see demonstrative pronoums followed by the two prepositions “dans” and “à” too. Thank you for the post. What would be a good translation for this use of “celle”? J’me plais à dire que j’suis l’unique… est-ce que c’est ça être utopiste? The lyrics are from the song “Homéostasie Crânienne,” by Ingrid St-Pierre. I’d say “the one”, “the woman”, “the girlfriend” – something like that.